So its been a while, I’m sorry. I have neglected you my little blog. I’m here now to make amends. And promptly ordered 3metres of it. Its a roma jersey jacquard. Its quite textured and feels almost woolly, but its not. 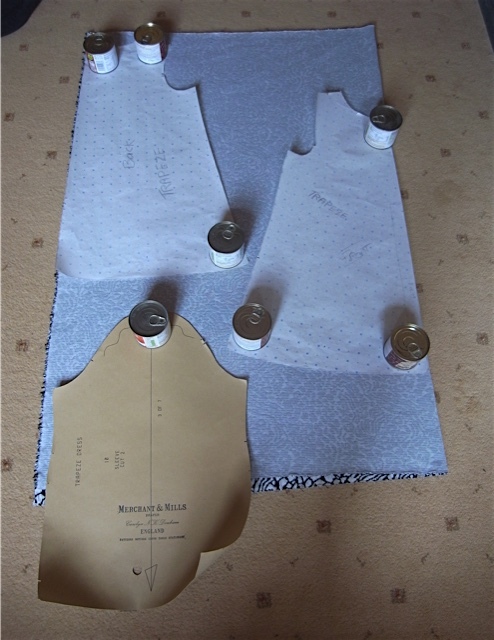 And unlike most jersey fabrics it does need to have the edges finished as it has a backing and I think the potential to fray. 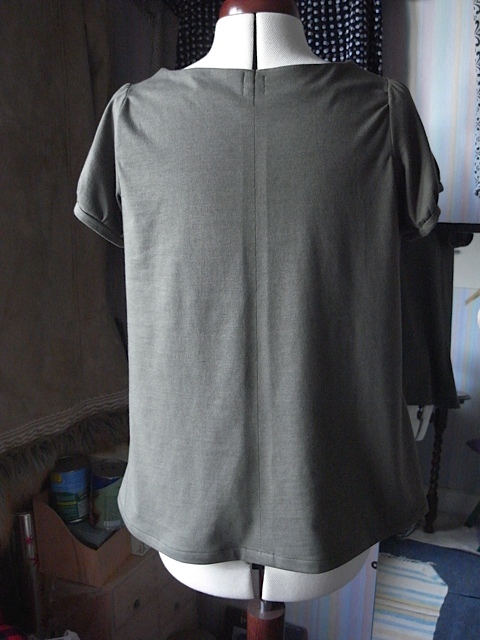 Besides that it was lovely to work with and I enjoyed making yet another trapeze top with it. 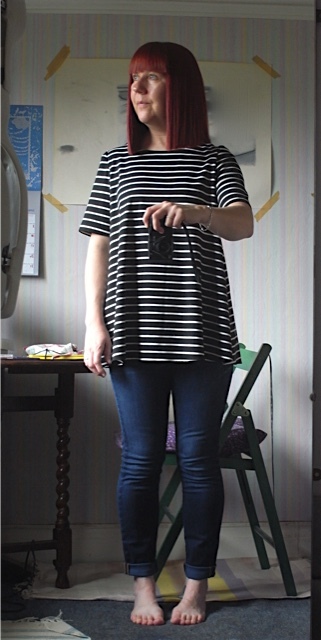 I used just over a metre for this top leaving me enough to hopefully make a dress out of it too. Would have had to use way more than a metre if I’d made a long sleeve version. 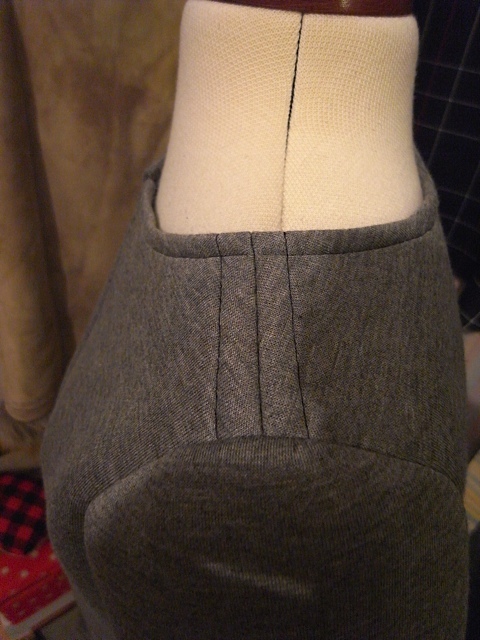 The above picture shows that the sleeve pattern piece is hanging off the end of the fabric. Didn’t take long to make and I’m very happy with it. 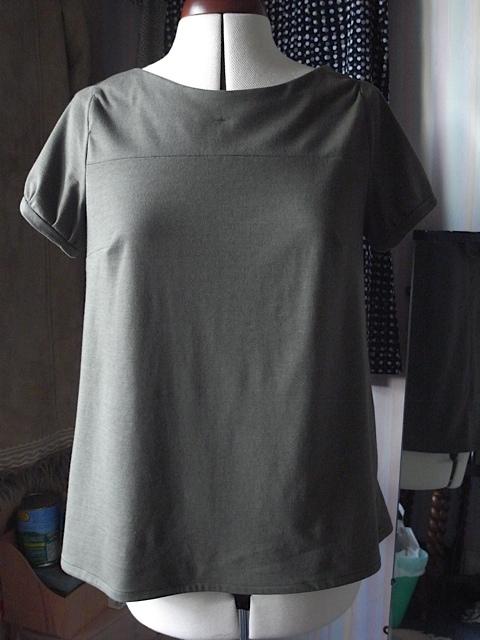 The fabric feels lovely to wear and I think would look good in a sweatshirt type top. I must have a go at making one, one day. My Husband seems to quite like it too which is nice. 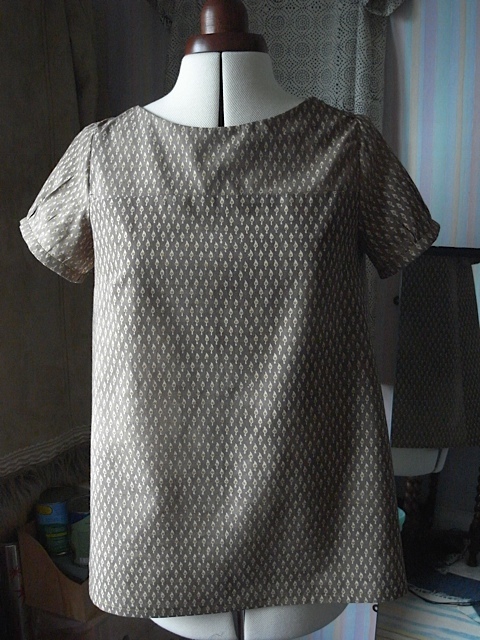 I really really love the dress, I wear it with jeans and without and have worn it lots! So I think I can conclude from this that I’m most comfortable in jersey. I try to look stylish but top of my agenda nowadays is comfort. 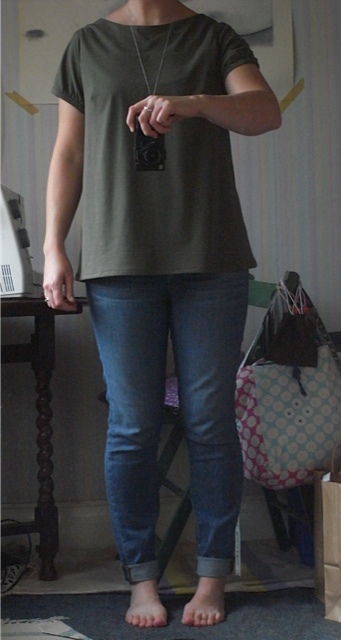 Gone are the days of wearing clothes that I had to continually adjust and fidget with. Its comfort all the way now and I don’t care. Well I sort of do obviously as I still want to try and look nice. I’ve also used this bag a lot. I love it! I should never have shortened the length or the sleeves, it was fine as it was, now I don’t like it anymore and feel uncomfortable in it. The fit on this went a little wrong and isn’t as comfortable as it should be, so thats been taken out. As have most of the cotton Mathilde blouses. Gone right off them. I still love the dress versions though. 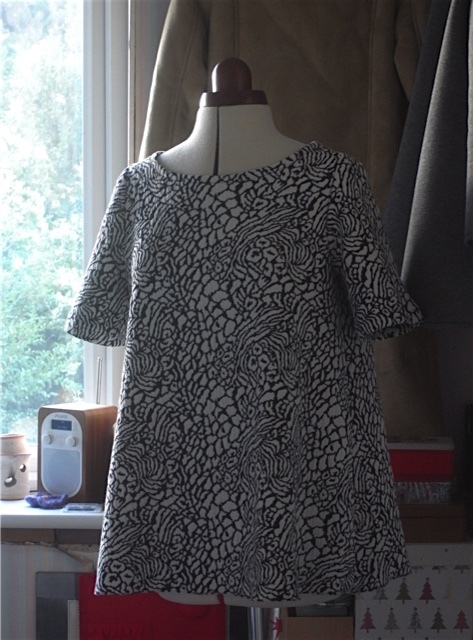 I love the fabric on the above top, but it has become tight across the bust I feel and once again is not comfortable. Shame as I really do love the fabric. There a re many more and I won’t bore you with them all. So I’m learning what suits me and what fabrics I like best and will hopefully start to make better decisions regarding what I’m wearing, but don’t hold your breath. 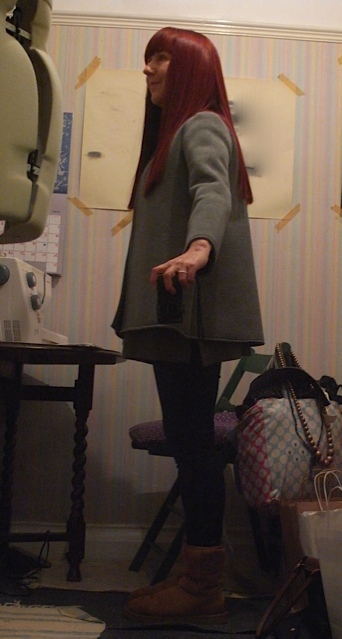 Have you learned what suits you more since starting to make your own clothes? 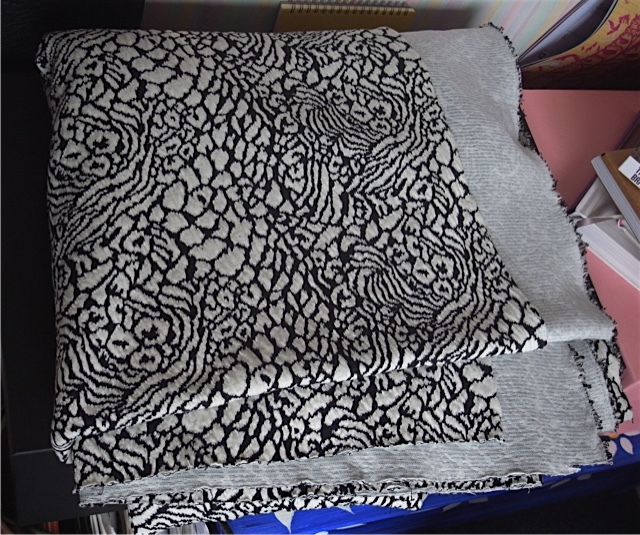 I bought two metres of scuba fabric a couple of months ago. And when it arrived I was like, WTF am I going to do with this? I really hadn’t got a clue. It appeared to be a lot thicker and more structured than I was hoping for. So it went on my stash pile to be pondered over while I worked on other things. 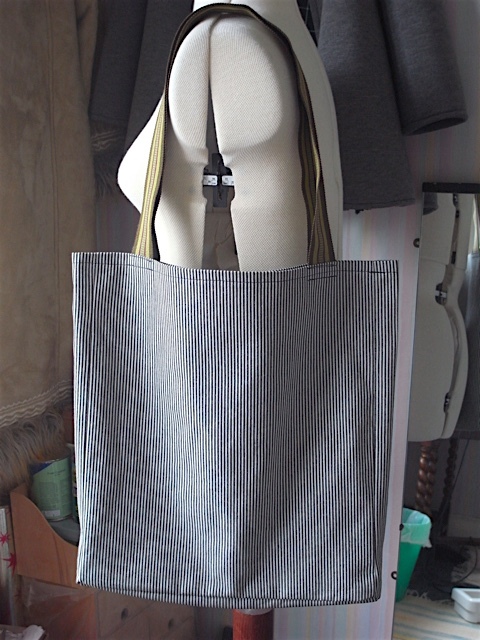 I liked the idea that it wouldn’t fray and so I wouldn’t need to finish the seams, which helps to make any project that bit quicker. So I was a little disappointed after washing it to see that the grey side was starting to fray a bit and coming away from the foamy bit in the middle. 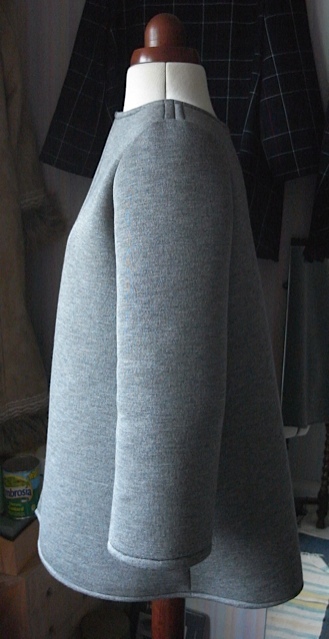 I had thought I might have a go at making another Strand coat but after seeing the fraying I really didn’t feel like going through all the effort to finish the seams, so I scrapped that idea. 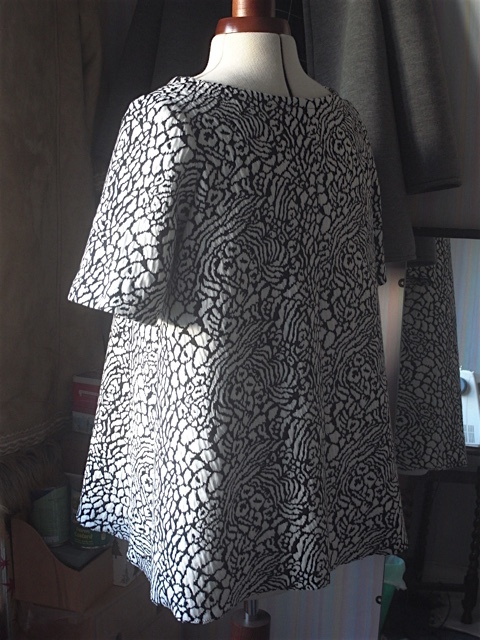 I eventually settled on making it into a Trapeze top, I thought it would make a fairly good one and might be nice and warm for the winter. 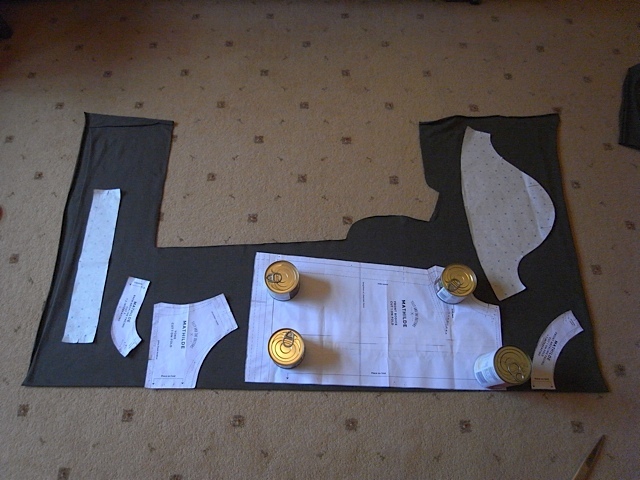 So I cut out the fabric. I didn’t cut out the neck facing in the end as decided it wasn’t needed. I put the back together and then attached the front to the back, tried it on to see how it was looking so far and hated it. The front was sticking out down the middle and looked really weird. 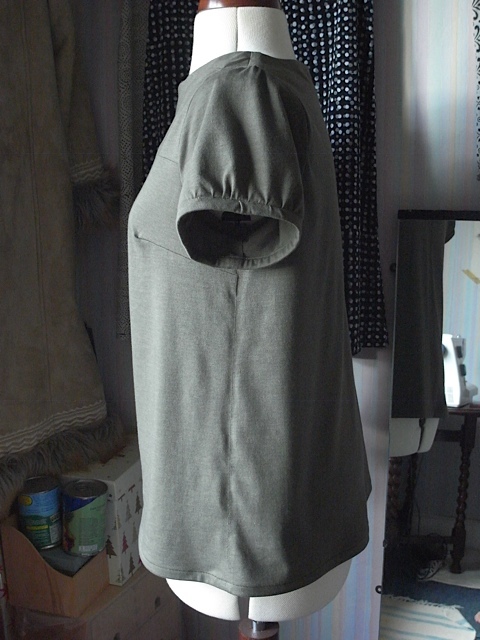 There was a possibility that it would lay better once I’d put the sleeves in but I wasn’t overly convinced. So I left it for that day and thought about it a lot. What was I going to do? I got up next morning, tried it on again thinking maybe I’d been wrong and it didn’t look that bad, but no, I was right it looked horrible. I took it off hung it up and decided I’d put it down to experience and bad judgement and just scrap it. Then something inside me said if you don’t care about it you might as well experiment with it. I tried it on back to front and it sat a lot better on me like that. Was sticking out at the back now but didn’t look as bad like that. 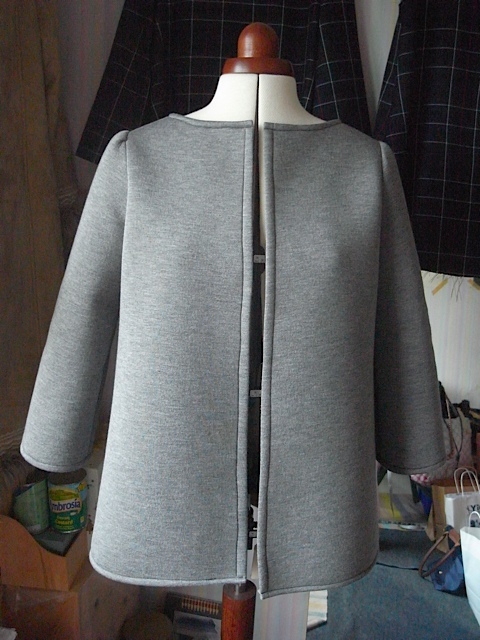 So I decided to attempt to turn it into a jacket/cardi. 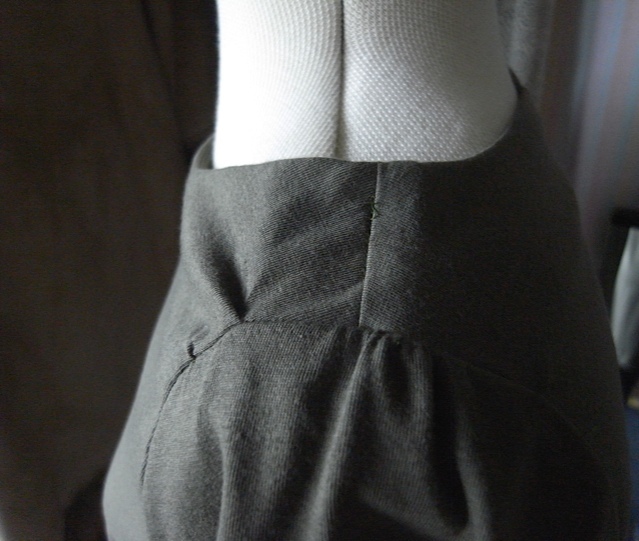 I unpicked the centre back seam, stitched the seam allowance down to make the edge look nice. 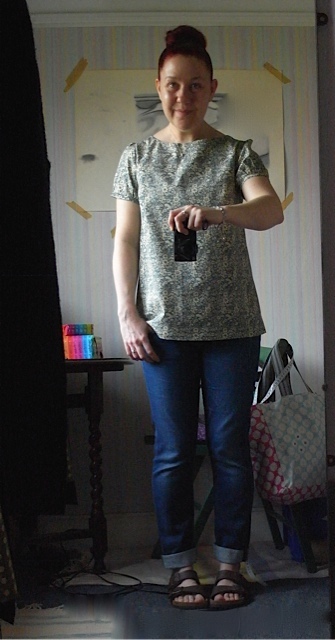 Put the sleeves in, tried it on again, yep think I can get away with it. 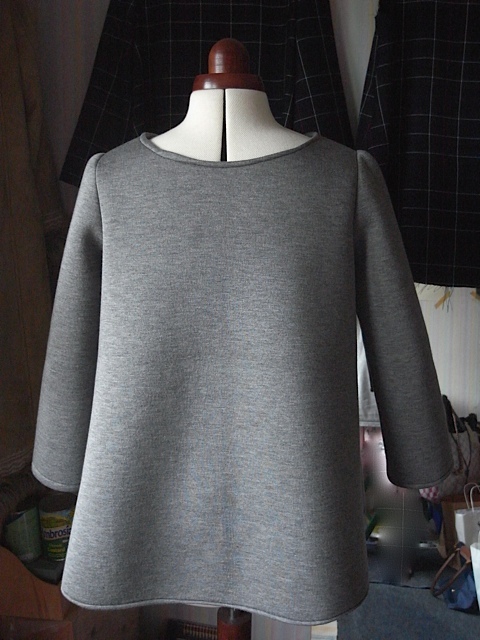 I turned the neck in on itself to neaten the edges, that worked quite well and then did the same with the hem and the sleeve hems. And BINGO, there was a jacket/cardi thing! There will now follow lots of pictures, as I’m really really happy with this. Hem looks uneven here but its not. 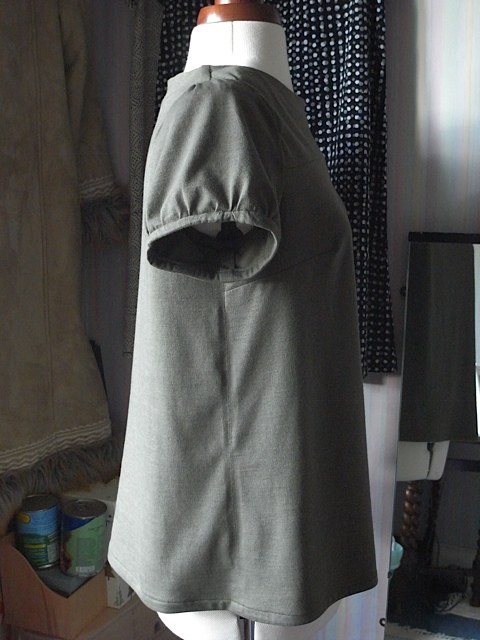 Have thought about adding pockets, but for now I’ll leave it alone. Thats another thing I love about making my own stuff, I can evolve it as I see fit, whenever I like. The back, that was the front. 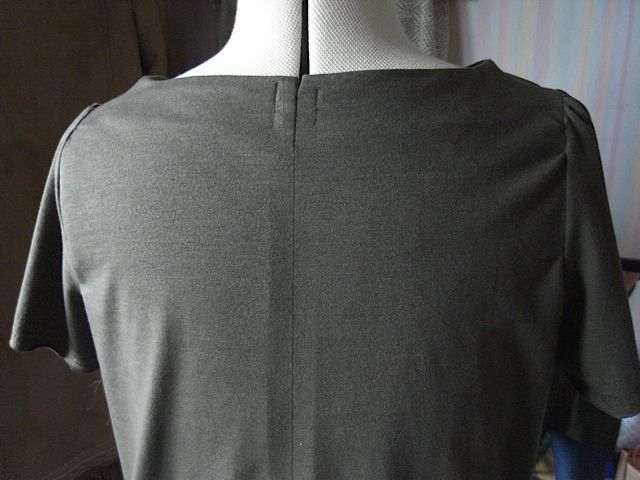 I stitched the shoulder seams down so they would lay flat. Quite like how it looks. 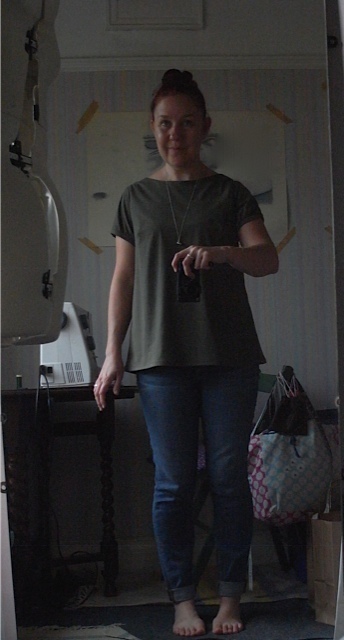 Not the best pictures, but here’s me wearing it. 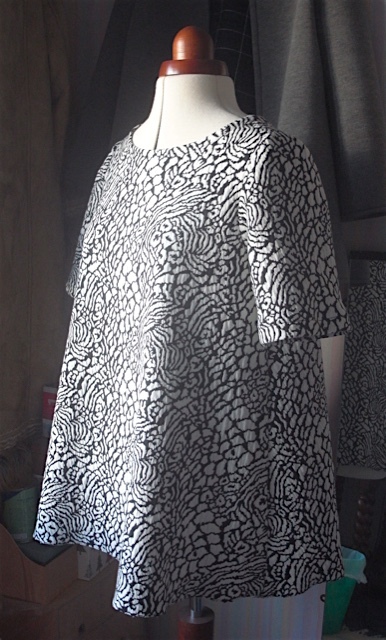 Its so comfortable to wear, I love the sponginess of the fabric, makes it feel light but its also warm. My Husband said it was elegant in its simplicity. And the edge to edge styling of it does give it a somewhat smart and elegant feel. I think it can be smart or casual myself depending on what else I wear it with. 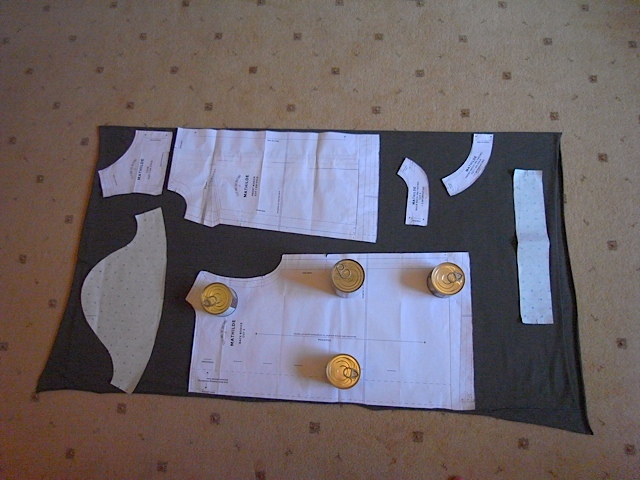 And I’m so glad I didn’t scrap it and just throw away the £36 I spent on the fabric. So all in all feeling a little smug with myself right now. I’m using the last of the jersey I bought from Merchant & Mills some time last year. And I’m very glad they no longer sell jersey as it will stop me being tempted to buy more. 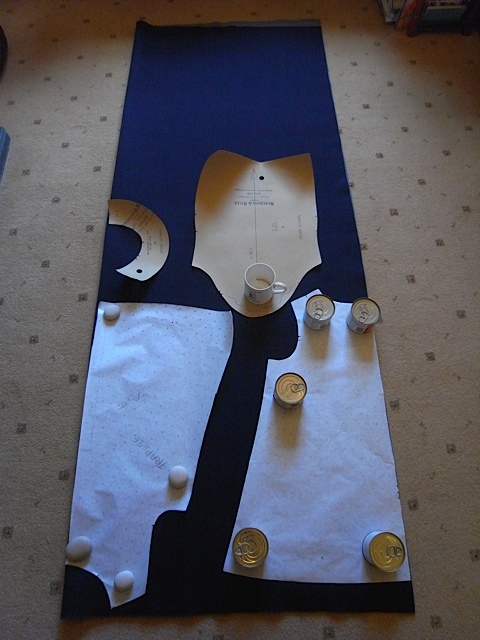 As you can see I’m using tins as weights to hold the pattern whilst I cut round it. This is proving to be the best method. Once again some problems with puckering at the shoulders, but I really don’t care. Looks a bit bad here at the shoulders. I’m not too happy with the bust darts either, they seem to sit a bit funny. Doesn’t really show too much here. And doesn’t look too bad on. Its just that I know. 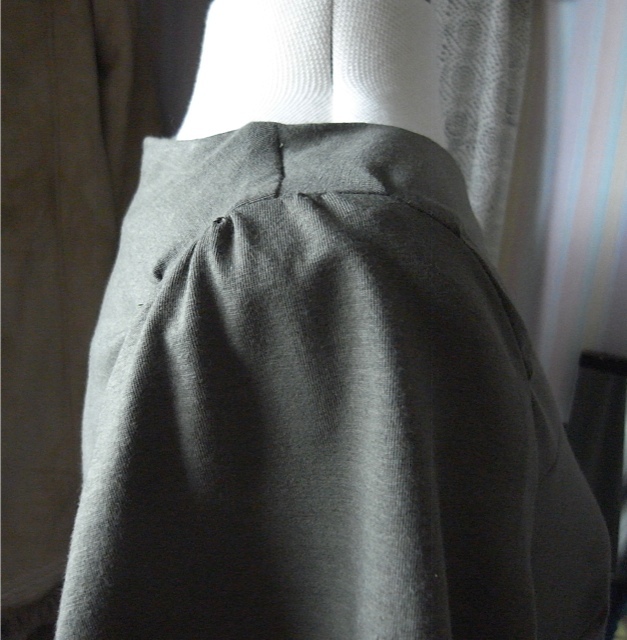 Side seams look a bit wonky, but once again doesn’t really show when being worn. I think its safe to say I’m not overly impressed with it. I will wear it, and maybe I’ll grow to like it as much as I do the other one, but I’m not holding my breath!